Includes 4CDs and 2Blu-rays, 135 tracks! Explore and enjoy the Imagine album and the 1971 Ascot Sound Studios & Record Plant Sessions like you've never seen or heard them before! This exciting six-disc (four CDs and two Blu-ray audio discs) super deluxe edition box set is remixed and remastered and contains a host of outtakes, sessions demos, alternate takes, surround mixes and more — 135 tracks in total! Fully authorized by Yoko Ono Lennon (who oversaw the production and creative direction), this new edition takes us on incredibly personal journey through the entire songwriting and recording process - from the very first writing and demo sessions at John's home studio at Tittenhurst Park through to the final co-production with Phil Spector — providing a remarkable testament of the lives of John Lennon and Yoko Ono in their own words. 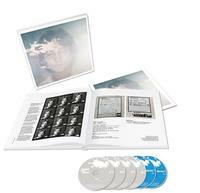 This set offers a variety of "immersive and intimate" listening experiences including what are being called the "Ultimate Mixes" of the album which promise amazing definition and clarity to "Raw Studio Mixes" which allow fans to hear original stripped back performances to new 5.1 surround mixes and the old Quad Mix which is available for the first time in more than 45 years. Of particular interest is "The Evolution Documentary," which is describe as a ‘track-by-track audio montage' that takes you through the development of each song from demo to master recording via "instructions, rehearsals, recordings, multitrack exploration and studio chatter."